Have you ever found yourself looking around your house thinking “what a mess”? Whether there’s stuff piled sky-high on top of your cupboards or your back closet is bursting at the seams, it can be easy to want to run and hide when you think about the clutter that’s building up. 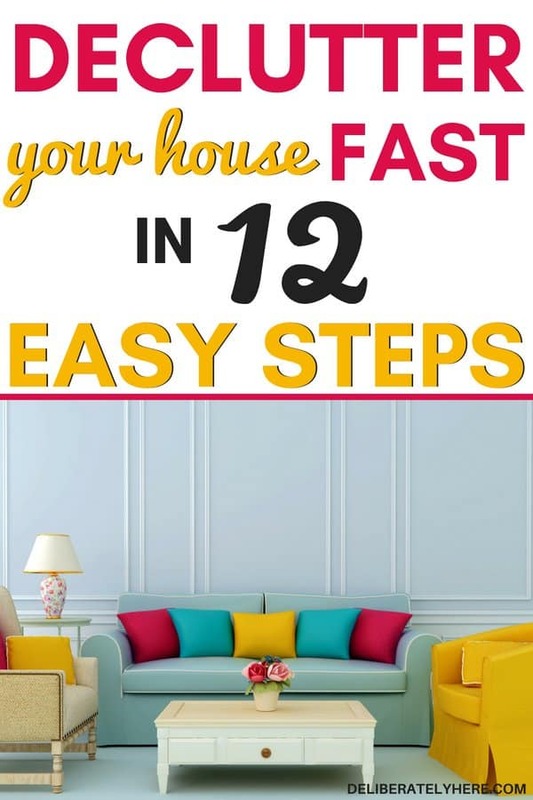 Here is a simple list on how to declutter your house fast – in 12 easy steps. Clutter used to be something that I would have much sooner ignored and try to forget about than have to actually face and deal with, until I came up with a solution. 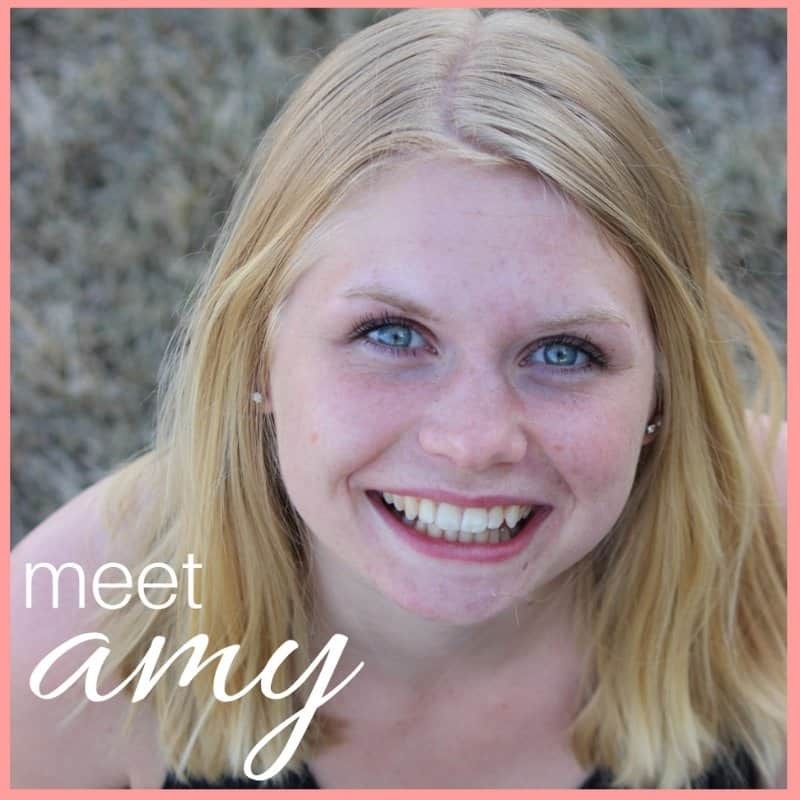 Does clutter rule your life? Is it overtaking your home? Do you find yourself feeling overwhelmed by the very thought of sorting through all that clutter? Clutter can come in all shapes and forms, and it doesn’t always come in the image of a messy house with small walking trails weaved through all the junk. A cluttered house could be a house that looks neat and tidy to a stranger, but to the owner, there are small things hiding all around the house that really aren’t necessary. Big or small, clutter is clutter, and the sooner you catch and deal with it the less stress you will have. The first step to decluttering is asking yourself a couple questions about certain objects. Some of these questions are: When was the last time I used it? Is it broken? If I saw this at the store, would I buy it? Do I have more than one of these or something else that serves the same purpose? Is there a place for it? Can I see myself using this in the next 6 months? Do I truly need it? Does it serve any purpose? If the last time you used an item was over a year ago, or even six months ago, it’s likely you can safely get rid of it. If you haven’t used it in that long, chances are you won’t need it again, and you won’t even miss it when it’s gone. For some reason, we have a tendency to hold on to broken things. Maybe it’s something sentimental that you can’t bear the thought of giving up, or maybe it’s something that broke and you’re keeping for that day when you can get around to fixing it. How long have you been holding on to this broken object? It might be time to face facts that you aren’t going to get around to fixing it and it’s just adding to your clutter pile by being in your house. IF I SAW THIS AT THE STORE, WOULD I BUY IT? Be honest with yourself when you answer this question. You can’t just say yes because you don’t want to get rid of it. Does this item hold value for you, and would it be something you would be willing to spend your hard-earned money on? DO I HAVE MORE THAN ONE OF THESE OR SOMETHING ELSE THAT SERVES THE SAME PURPOSE? Duplicates are one of the sneakiest ways to collect clutter. Whether you have a backup coffee maker in the storage room or you have several of the same item laying around, it’s time to get rid of all the duplicates. If there isn’t a place for it other than stuffed somewhere that it doesn’t belong, it shouldn’t be in your house. The key to keeping a clutter-free home is only having as much stuff as you can properly store. This doesn’t mean properly stuffed into a storage room, this means that it should go where you intended it to go in your house, and if there isn’t room for it, it doesn’t belong. CAN I SEE MYSELF USING THIS WITHIN THE NEXT 6 MONTHS? Can you see yourself using this item within the next six months, or is it just going to get placed back into the closet only to be forgotten about until the next time you purge your house? DO I TRULY NEED IT? This is an important question to ask yourself with stuff in your house, and with stuff that you buy. Do you really and truly need it, or are you just keeping or buying it because it’s something that you think would be neat to have? If you don’t need it – don’t buy it. If it’s not serving a purpose other than taking up space, it shouldn’t be in your house. Now that you’ve asked yourself these questions, here are a few ways how to declutter your house fast. If your mindset isn’t in the decluttering state before you attempt to tackle the clutter in your house you are going to have to change your mindset. If you have a mindset of wanting to hold onto everything in your possession and you’re seriously dreading getting rid of stuff, you won’t get anything done. First, you need to change your mindset, then you will be able to accomplish decluttering your house. As you start to tackle the clutter in your house, you will always want to have three different bins or bags on hand. One bin is for the stuff that is at the end of its life and needs to be thrown in the trash. One bin is for stuff that is still in good shape, but you don’t need anymore. The last bin is finally for the few things that you will keep in your house. Approaching every room of your house with these three different bins will help you make decluttering so much easier. The thing to remember is that everything has to belong somewhere – so everything in the room as to be able to be addressed to one of the bins. You’re either going to keep it, donate it, or throw it out. Something people tend to do when they want to do something fast is they try to do it all. Unfortunately, unless your house is nearly clutter-free already, decluttering your whole house isn’t going to be able to be done all in one go. The fastest way to declutter is actually focusing on one task at a time all the way through to completion. This means you don’t start decluttering your bedroom, then halfway through head over to start in the bathroom, then remember that you have a pile of paper clutter on the kitchen table that needs to be dealt with. Tackling one task at a time means you decide which task you’re going to start with. Either the pile of paper clutter, the bedroom, or the bathroom (not all at once), then you start and see that task all the way through. Only when you can completely finished one task should you move on to the next one. Don’t buy into the lie that doing everything at one time is the fastest way to do stuff – it’s not and it will only set you back. If you decide to start with the pile of paper clutter, this means you would sort through it and divide it up into piles of paper that you no longer need and paper that you are going to keep. Then you would throw the papers you don’t need into the trash and put the papers you are keeping neatly away in your filing cabinet, or wherever they belong. Then you would go and bring the trash out to the garbage can, THEN, and only then, are you ready to move on to the next task. Do you have a vision in mind that you would love for your house to look like? Break it down to certain rooms of the house, what would they ideally look like if they were organized and clutter free? Once you have that image in your mind, start with one small spot in your house and work there until it looks how you want it to look. 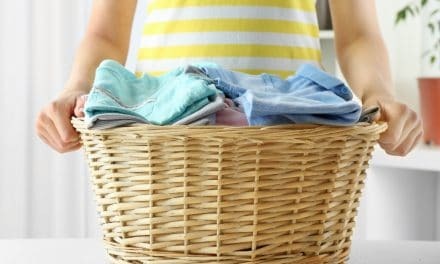 Having a vision for your house makes decluttering and organizing a whole lot easier than going into it blindly. One thing that hinders many people from achieving the clutter-free home they envision is the fact that they aim for perfection and are satisfied with nothing less. While it is good to set a goal that you want to work towards, if your goal is to have your house look exactly like that perfectly organized and clean house in the magazines, you will never be satisfied. The truth is, those houses wouldn’t look that good if they had a family living in them. The reason that those houses look so perfect is because they aren’t sustaining a family. They are staged and set up for photos, not to be lived in. You should set goals for how you want your house to look, and you can even take a few pictures out of a magazine to help motivate you to achieve a neater home, but it’s important that you remember that your house will never look that good. It will never be that perfect. You’re raising a family in your house, and it’s going to show. That’s nothing to be upset about. 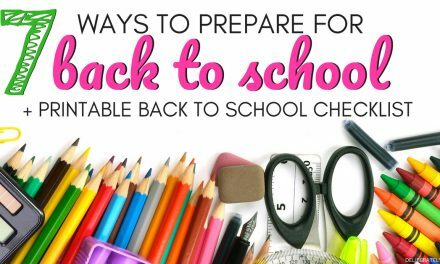 While it might sound tempting to jump all in and get your house completely decluttered and organized in less than a day, unless you have an entire day with no distractions to dedicate to decluttering, that isn’t going to happen. Even if you do have all the time in the world to declutter and organize, I don’t recommend that you do it all at once anyway. After a few hours of decluttering, you will start to get bored of it and lose productivity. This means that you won’t be as thorough with your decluttering and more things will get left behind and won’t get accounted for. Rather than letting decluttering burn you out, create a declutter calendar and schedule time in every day for decluttering. Only schedule a small amount of time, up to 2 hours of decluttering per day so you ensure you are doing the best job you can do and don’t get burned out quickly. I’m sure we all have a couple of broken objects somewhere in our house that we’re hanging onto just in case we ever get time to fix them. If you’ve had something broken lying around your house for the past few months that you haven’t gotten around to fixing, you likely aren’t going to get around to it at all, and it’s time to toss it. If something broke that you know there’s no way you could or would fix, toss it right away. Don’t hold on to things with the mindset of “one day”, because there’s a really good chance that one day isn’t going to come and it’s going to end up sitting broken in your storage room for months and years to come. While a junk drawer is a great way to keep small miscellaneous items from being scattered around your house, many people start to take advantage of their junk drawers and start throwing things in there that don’t belong in there. If you don’t have a place in your house for something, it’s time to get rid of it. Everything should have a place. It’s important to remember that if you don’t have room for it, no matter how cool it is, you shouldn’t have it. It will just make your house look cluttered and messy if you start putting things where there’s no proper space for them. This is a tough one and something that I still struggle with daily. Even though I love to have a clutter-free home that is neat and tidy, I still hate to throw things away. No matter how wasteful you feel when you throw things in the trash, you are wasting more space by storing it in your house if you don’t really need it. If you have something that you can’t help but feel wasteful for throwing out, donate it instead so someone else can get some use out of it rather than having it sit around collecting dust. I was always afraid to throw things out because I was so sure that a week after I got rid of something, I was going to need it. The truth is, I had been going months upon months, even years, without most of the stuff that I got rid of so if I can go that long without it I don’t think I’ll all of the sudden have a dire need for it as soon as it’s gone. Your work isn’t done once you’ve decluttered your house and gotten everything sorted into the correct bags or bins. Now it’s time for you to actually load these bags and bins up into your car and take them to the appropriate places, whether that be the dump or the thrift store. Make decluttering fun by incorporating the whole family in it. Give everyone a task to do to contribute to the decluttering. The good news is that your kids don’t even have to be that old to be able to pitch in. 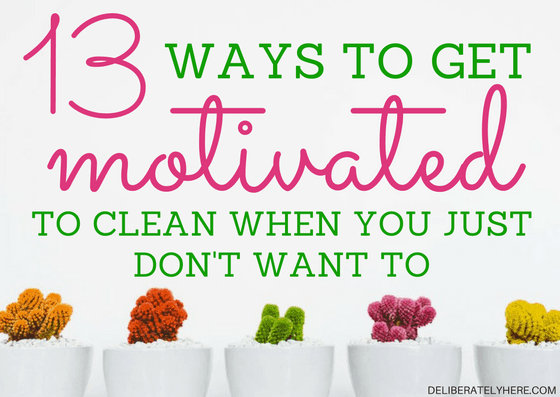 Making decluttering fun is important in helping you to stay motivated to keep going. If it’s something you dread, it’s more likely to get pushed off for another day or avoided altogether. Try to make decluttering fun for you. 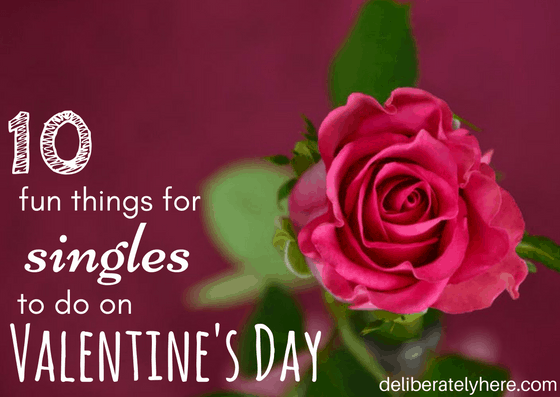 One way to keep it light and fun is making sure you only do a bit at a time and not overloading yourself to the point where you get worn out and start to dread decluttering. Once you have decluttered your house you might think you’re done – but your work doesn’t end there. After you’ve created a clutter-free and organized home it’s time to make sure you keep it that way. Keep track of your clutter by doing a check every evening or every week and ensuring that purchases you make are things you absolutely need and not things that will eventually just turn into clutter. If you declutter your house once then leave it again for months on end, you’re just signing yourself up for another big purge of your whole house, rather than if you do small decluttering tasks every day to avoid having to do another big purge. Do you struggle from a cluttered house? 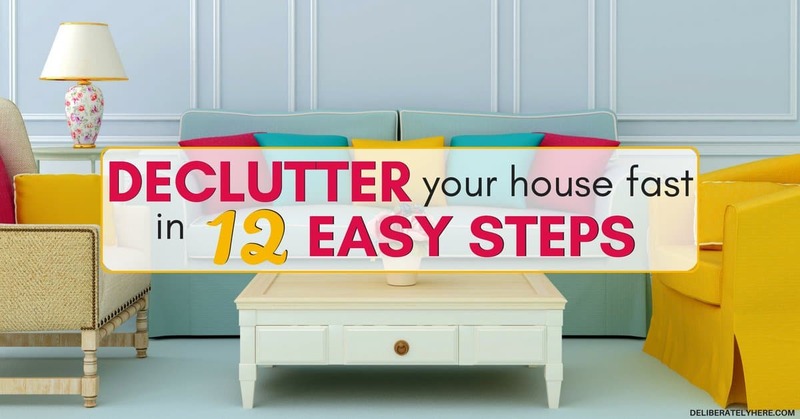 Which one of these 12 ways how to declutter your house fast is your favorite? 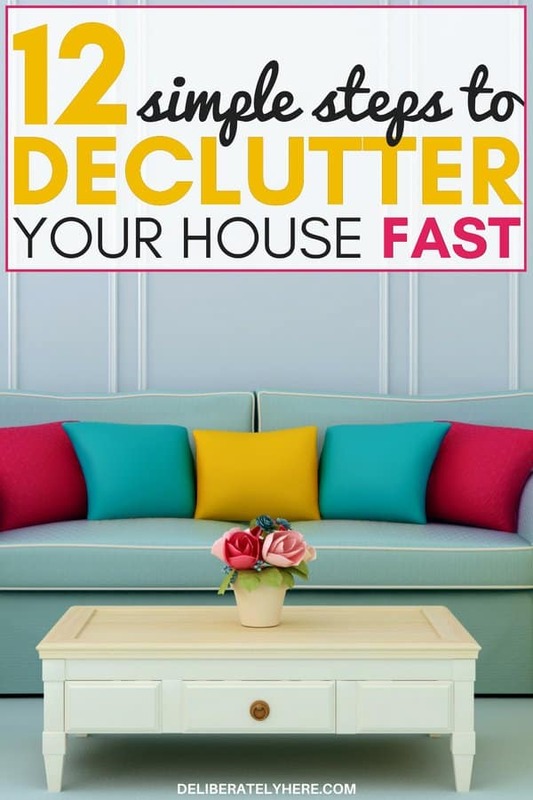 What decluttering tips do you have for how to declutter your house fast? I’d love to hear from you!